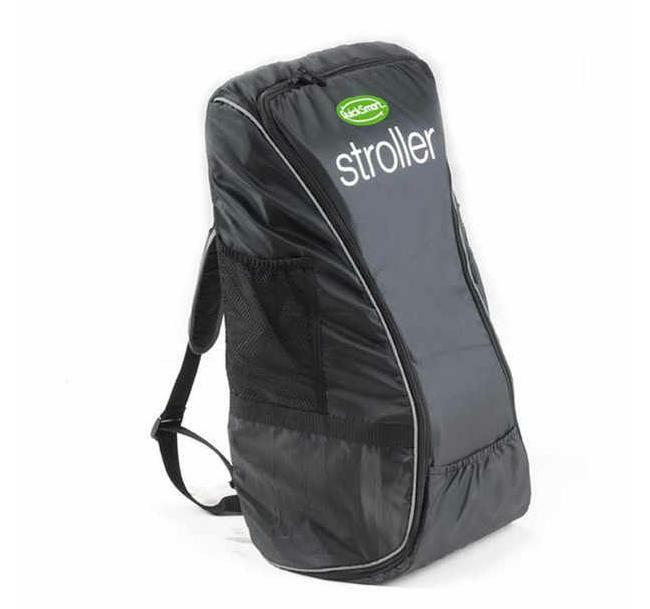 Seen below is a backpack marked “Stroller.” But where’s the real stroller? It’s inside the bag. We could’ve used a genuine pic of the QuickSmart in action, but the overwhelming majority of them were craptastic in quality. The QuickSmart is a real piece of equipment designed for a certain kind of person/s. Because unless you travel a lot, which means you probably own a whole closet of stroller bags, there’s little need for the QuickSmart. What it fundamentally accomplishes is being a transformable pushchair for the babies. The clincher is it’s not a new invention but far from it. The QuickSmart has been available in Austria and other places for some time. But it wasn’t until this month that its U.K. debut was finally announced. What the QuickSmart has going for it aside from its portable features is a lightweight frame, rugged off-road engineering, and a padded seat. There’s also a storage basket for extra cargo (aside from the baby). At just 4kg when folded, the QuickSmart is wonderfully portable when it isn’t hauling your little precious. So portable, it’s ideal for not just trips abroad, but any drawn out journey in particular.